Gold Reef City Casino | Kidz Rock 2018 Rewind for 2018! 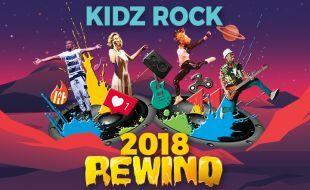 Get ready to party - as Kidz Rock rewind the hits of 2018! Paying tribute to the billboard top 40 hit songs - 2018 was an incredible year to rewind! If you are a Taylor Swift, Selena Gomez or Jonas Blue and Drake fan, or can’t get enough of Ariana Grande, Maroon 5 or Ed Sheeran – we have the perfect show for you. The Gold Reef City Rewards cardholder discounts may not be used in conjunction with any other discounts or promotions and is limited to 10 tickets per show per cardholder. Experience Package for 2 - *cannot be used in conjunction with other specials, promotions, rewards or loyalty discounts (including free entry for kids on selected days, and Pensioners discount).